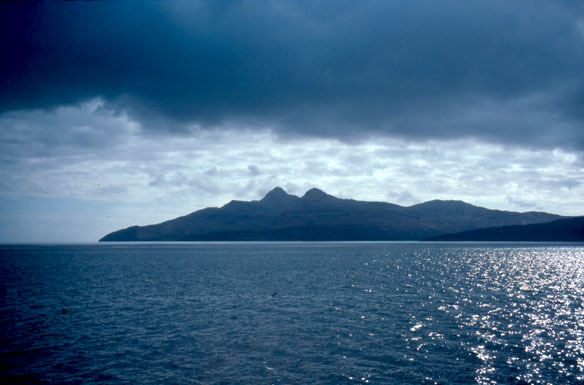 Sailing towards the island of Rum, the first thing you spy on the horizon are the dramatic peaks of the Cuillin. Staring towards these jagged lumps, your first instinct is to wonder just what freak of nature could have created such a landscape. It must have been something pretty powerful, to have left such sharp, craggy outcrops. Indeed it was. 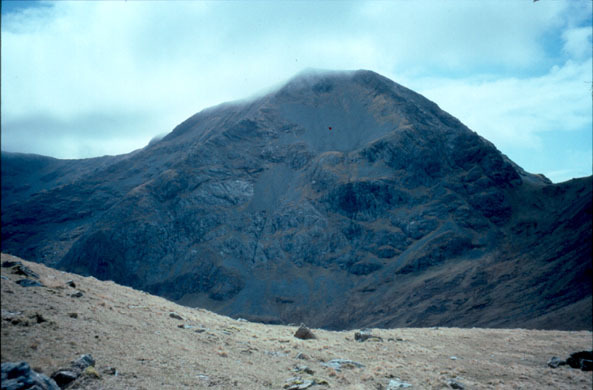 For the tops of the Rum Cuillin are all that remains of a giant volcano which must have exploded with quite some ferocity to leave such a trail of destruction in its wake. Over the centuries that followed, the peaks - which began their life close to the equator - were weathered by time and changing climates to leave the ridge as it is today. A complete traverse offers some of the best walking and scrambling in Scotland, combined with stunning coastal views. Two of the tops are Corbetts and thankfully the ridge is not nearly as difficult as the Black Cuillin, across the water on Skye. 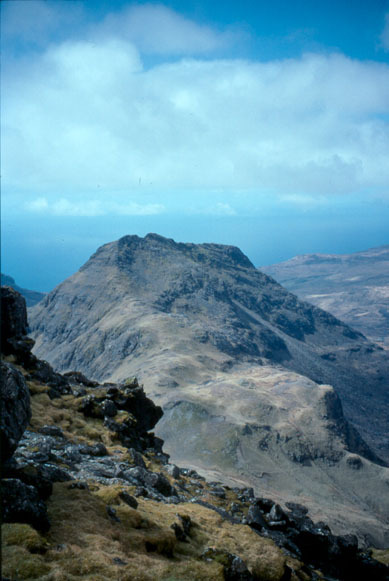 However, like the gabbro of its more famous neighbour, the volcanic rock of the Rum Cuillin is wonderfully sticky, helping boost confidence as you scramble up and down devilishly steep slopes and along wonderfully airy ridges. Routecards should be left in the small white box at the reserve office before you head north along the track towards Kinloch Castle. As you approach this imposing sandstone mansion, cross a stile on the left, following a sign for the Rum Cuillin. The route skirts across a grassy field below the castle and enters woodland, passing through a wooden gate and then by a small stone hut where the island power generator is housed. 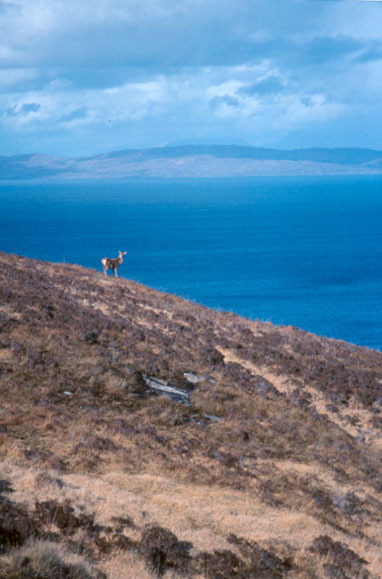 Further up you emerge into open countryside at an SNH information board with a relief map of the island's upland terrain. The path leads out over moorland, following the Allt Slugan a'Choilich as it rises to a tiny dam high on the hillside above. Beyond this there's a gate in the deer fence traversing the hillside. We followed the path up into Coire Dubh and when we reached a small stone-built dam, we set a course east, traversing round the northern flank of Cnapan Breaca, rising up on to the north-west ridge of Hallival. Here there's a fine view of what is to come later in the day. 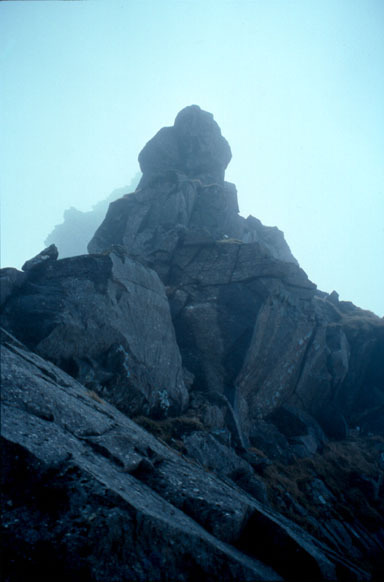 The walk towards the base of this rock-clad lump is easy. From there an obvious path twists steeply up through the rocks, boulders and crags and there are only a couple of spots towards the top where some easy scrambling is required. A cairn marks the summit where there's a daunting view south to the day's highest peak, and the first of the Corbetts, Askival. Surprisingly, the ascent of Askival is actually much easier than it looks, if you avoid the notorious Pinnacle. 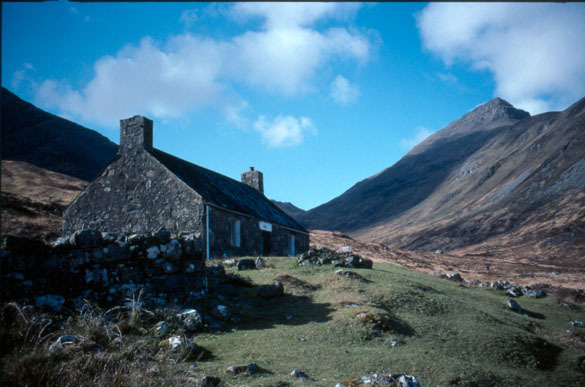 The path picks its way down the rocky southern slope of Hallival to a col and from there rises along a narrow grassy ridge, to the base of a large rock spine. Reaching the top along this north ridge requires a scramble, plus a 30-foot moderate climb up a steep slabby step (the Pinnacle). This can, however, be avoided by detouring left from the base of the rocky section on to the east face of the hill where a path picks its way up through the jumble of boulders and crags to the stone-built trig-point. Getting off Askival is easy, if painfully steep. We walked west from the summit and descended left to avoid the rocky west spine. 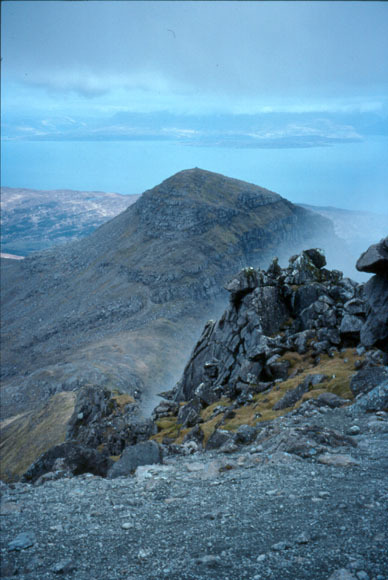 Contouring round lower down lead us to Bealach an Oir, of the Pass of Gold, where the ascent of Trallval begins. This is perhaps the least complex of the day's ascents. Although Trallval looks, on approach, like a fairly bland lump, it boasts a fine twin-topped summit, an airy ridge with fearsome drops connecting the pair. The higher of the two the west one requires a bit of clambering over rock and there's a degree of exposure with long drops into the glen below, but it's not difficult provided you take care. The descent from the summit into Bealach an Fhuarain (Pass of the Springs) is perhaps the least pleasant of the day - you need to go very carefully, picking a way down through the rocks and scree on the south slope of the peak. Staring up at the black armour guarding the upper slopes of Ainshval your first instinct is to wonder if it can be breached at all. It can. The initial task is to reach the top of the first steep buttress. 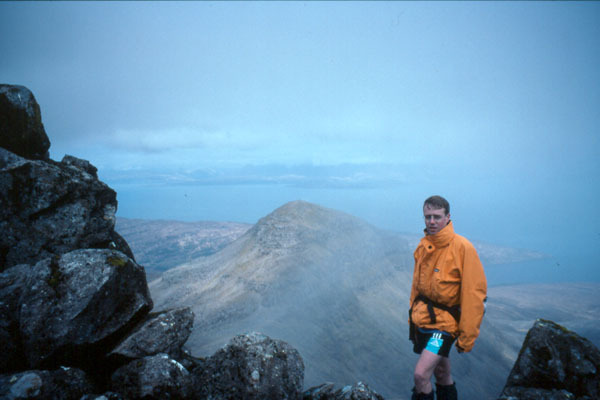 This is done easily by skirting right from the bealach along a grassy path to the base of a scree-slope where a path zig-zags its way up on to the ridge. From here it's possible to scramble up the steep airy rocky spine above, but this is tricky and you are subject a fair level of exposure. 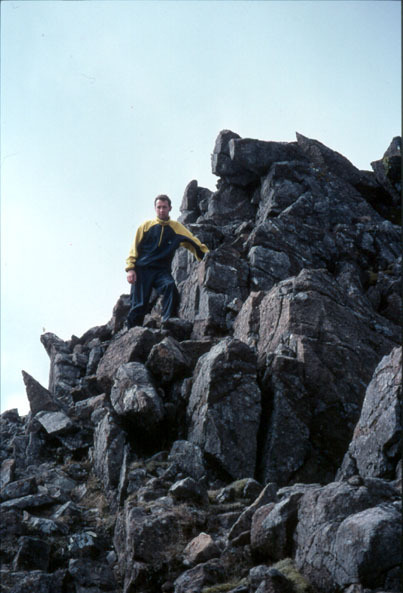 An easier option is to skirt left in towards scree-filled Grey Corrie on the east face of Ainshval £ the second Corbett of the route - and a narrow path climbs below the ridge to the summit cairn. From there head down into the col and over an unnamed top, then descend south-east and climb up on to the final summit of the day, Sgurr nan Gillean. With the peaks in the bag, there is still the small question of getting off the ridge. You can descend back into the col to the north-west of Sgurr nan Gillean, then head down the slope in the direction of ruined Papadil Lodge. It's steep over slippery grass. Contouring left lower down brings you to the coastal path leading north to the bothy at Dibidil. This is a good spot for a brew to inject some much needed energy before the last five miles of the day over the rough and, in a lot of places, boggy path to Kinloch. Map OS Landranger sheet 39. Start/finish SNH Reserve Office. GR: NG 404993. Routecards are provided and should be left here. Grading A long, hard day with lots of steep ascent and descent. Some moderate scrambling is called for, while more difficult climbs can be avoided thanks to handy detours.